The sun circus is a magical place where every child and every adult travels into a world of imagination and illusion. When the show begins and everything goes dark, you just don’t know what will happen, but in the next instant the stage will light up and the big top is filled with dazzling coloured lights. Passing at that moment outside his dressing room, his friend the acrobat stopped to talk to him: “Hi Clarence! Ready to get out on stage?” he called. That was when the acrobat realised something was wrong with Clarence the clown, for although his face had a big smile painted on it and he was wearing a jolly red nose, his eyes were sad… “What’s up, my friend?” asked the acrobat. Without another word, the acrobat left Clarence’s dressing room, leaving him very surprised at the acrobat’s mysterious exit. “Thank you so much“, said Clarence to the acrobat, “I’m glad that you’re my friend”. Then Clarence the clown realised that he didn’t need to rely on a lucky charm – he only needed to trust in himself. He also realised that good friends like the acrobat make life easier when we see it as difficult. 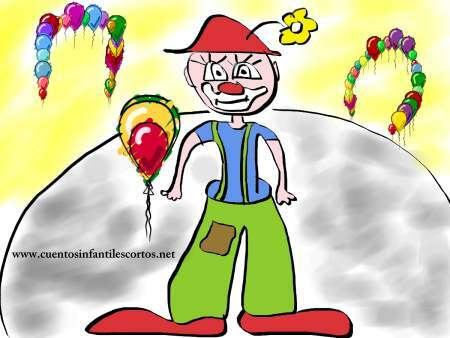 Short Story written by: Esperanza “Enjoy my show and laugh!” – that´s how Clowny, the happy clown, used to begin his performance. Every year children and adults from everywhere went to see him act, every kid but Alice who wasn´t happy there because she was scared of clowns.